Submitted by mahoney on Thu, 06/09/2016 - 8:53am. 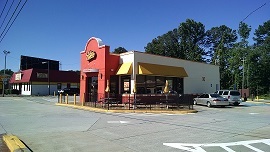 Pollo Campero is a quick casual restaurant concept which serves authentic Latin flavor. Everything on their menu is a modern twist on Latin American favorites. Spice and seasonings are tasted throughout the servings. Added new locations in Canoga Park,CA,Las Vegas,NV,Silver Spring,MD and Lynn,MA. Updated the file. Increase of 10 locations.